Brian Hong and Jery Beamer are a Top Producing real estate team in the DC Metro area based in the Alexandria Old Town Historic District and Georgetown Sales offices. 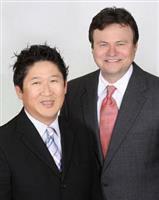 They have a combined experience of over 37 years of serving the real estate public. The client always comes first, and their repeat business and referrals attest to this. You want a fast response by email. You don't want to wait days to hear from us. We understand this. We try to answer every email from this site personally and ASAP. We pledge to you that we will answer your emails quickly. You will be pleased with how rapid and complete our response is. We Guarantee Your Privacy Will Be Respected When Using Our Web Site. This is all offered to you for free, and without any obligation! You can trust us with your important referrals. We have a great track record of success as top producers. We have the experience you are looking for. Plus we are very web-savvy REALTORS®, which is important to the majority of homeowners today. Why send a referral to anyone other than the best? This only reflects positively on you. As is often said, real estate is about location, location, location. We have extensive knowledge of the Washington DC and Alexandria VA areas and can help you find the right home for you or the right buyer for your home.